For other uses, see Lamella (disambiguation). Lactarius subdulcis fruit bodies with prominent adnate gills. The shape, colour, density and other properties of the (for instance, the gills here leak latex) are important when identifying mushroom species. A lamella, or gill, is a papery hymenophore rib under the cap of some mushroom species, most often but not always agarics. The gills are used by the mushrooms as a means of spore dispersal, and are important for species identification. The attachment of the gills to the stem is classified based on the shape of the gills when viewed from the side, while color, crowding and the shape of individual gills can also be important features. Additionally, gills can have distinctive microscopic or macroscopic features. For instance, Lactarius species typically seep latex from their gills. It was originally believed that all gilled fungi were Agaricales, but as fungi were studied in more detail, some gilled species were demonstrated not to be. It is now clear that this is a case of convergent evolution (i.e. gill-like structures evolved separately) rather than being an anatomic feature that evolved only once. The apparent reason that various basidiomycetes have evolved gills is that it is the most effective means of increasing the ratio of surface area to mass, which increases the potential for spore production and dispersal. The genera Russula and Lactarius of the Russulales. 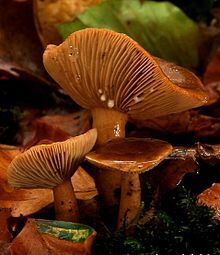 Several genera in the Boletales, including Gomphidius and Chroogomphus as well as Tapinella atrotomentosa (which has been traditionally named Paxillus atrotomentosus) and other species in that genus, the False chanterelle (Hygrophoropsis aurantiaca). Such polypore-like fungi such as Daedalea quercina, Daedaleopsis confragosa, Lenzites betulina and Gloeophyllum sepiarium. Members of the two related genera of chanterelles, Cantharellus and Craterellus, have rudimentary lamellar structures which are sometimes referred to as "false gills". They are distinguished from "true gills" because the structure of the fertile surface ("hymenium") continues uninterrupted over the gill edge, so they are little more than folds, wrinkles or veins. The genus Gomphus also has false gills. These primitive lamellae indicate how the evolution towards true gills probably happened. ^ See Tom Volk's Fungus of the Month for January 2008 for a description of the difference between "real" and "false" gills. ^ Moncalvo JM, Nilsson RH, Koster B, Dunham SM, Bernauer T, Matheny PB, Porter TM, Margaritescu S, Weiss M, Garnica S, Danell E, Langer G, Langer E, Larsson E, Larsson KH, Vilgalys R. (2006). "The cantharelloid clade: dealing with incongruent gene trees and phylogenetic reconstruction methods" (PDF). Mycologia. 98 (6): 937–948. doi:10.3852/mycologia.98.6.937. PMID 17486970. Archived from the original (PDF) on 13 June 2010. Retrieved 23 March 2013. CS1 maint: Uses authors parameter (link). 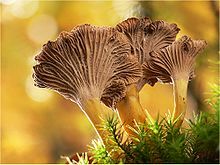 The important "false gill" characteristic of the chanterelles is discussed on page 938 and it is mentioned that lamellae of Gomphus are similar. Wikimedia Commons has media related to Lamella (mycology).